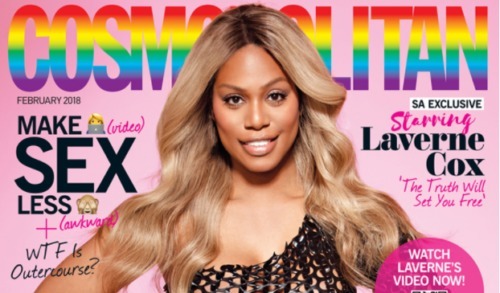 Laverne Cox is making magazine cover history yet again. Cox, who appeared on the cover of Time in 2014, is the first transgender woman to appear on the cover of Cosmopolitan. 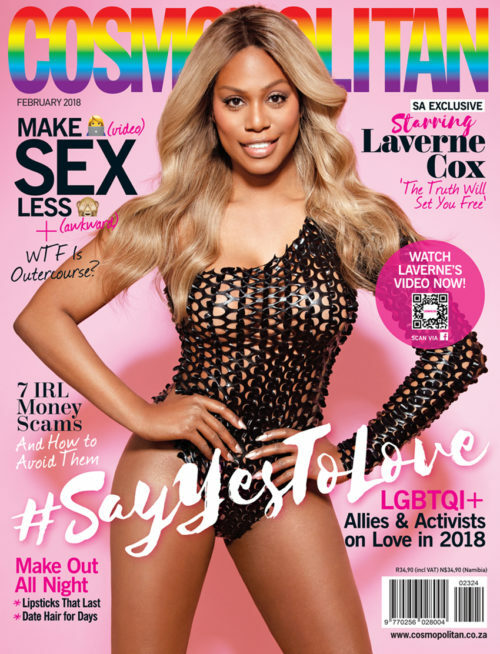 The trans actress and activist graces the cover of Cosmopolitan South Africa, which has been given an LGBTQ makeover for a special “Say Yes To Love” issue. Inside the covers of the magazine, readers will find a handwritten note from Cox. “Your voice matters, the truth of who you know yourselves to be matters. The truth will set you free!” it reads. “Trans women deserve to be loved out in the open and in the light,” she adds. “We wanted to disrupt hetero-normative ideas around February and Valentine’s Day and look at love in 2018 – including acceptance of self, others and non-binary relationships,” explained the publication’s editor, Holly Meadows. Cox is featured in a behind-the-scenes video from the photo shoot, where she opens up and gets personal about just how empowering it can be to find love and respect. Cox also reveals who her celebrity crush is, and who she’d most want to be stuck in an elevator with (Hint: There are rumors she might run for president in 2020). Finally, she offers an inspirational message to readers. “Let go of fear, and live a fun, fearless life. If I can do it, you can do it,” she says.